In the interests of organization and ease of access, Powerybase has released an iPhone app that’ll consolidate all of your bills and expenses information in one place. Bills ~ On your table will also has a Reminder function and free push notifications, so that you’ll never miss another payment. Just enter all the pertinent information (such as amount, due date, if it’s a repeating bill, etc. ), select an Alert day, choose a category that the bill falls under, and any other miscellaneous notes you’d like to be reminded of. After paying your bill, you can tap “Pay” so that it doesn’t show up in your Overdue list; you can also turn on the AutoPay option for any bill, if you’ve set up such an option with your bank. Most alerts and categories can be customized to your preferences. The main Bills page (first tab on the bottom) will feature all the bills you have upcoming within 30 days, along with any that are overdue. If you tap the Stats tab, you can view your total paid and unpaid, as well as according to bill category. This iPhone app also comes with a Passcode lock option, if you would like to protect any sensitive information. The developers also provide web access to create and manage your bills, for added convenience. This means that all changes and settings are synced with a Bills server, so make sure you are connected to the Internet if you want your changes and information uniform. Impressively, 170 currencies are supported, which is helpful if you’re spending overseas. Even more impressive is its gorgeous interface: slick, simplistic, and extremely well put together, this iPhone app is a joy to look at and use. Unfortunately, as it is still a new app, there are some slight speed bumps on their road to posterity. For one, it’s a bit annoying that we can’t use some symbols in the title; ATandT just doesn’t look the same as AT&T. For another, the due date on repeating bills cannot be changed, which doesn’t make sense, seeing as how everything else is customizable. One of the biggest complaints I have is that there are no options for partial payments, especially for credit card bills. Sometimes, that minimum payment is all you can afford to pay. But luckily, the developers have shown that they are interested in feedback and are willing to make changes, so I think Bills ~ On your table has a great future ahead of it. Grab it now at the introductory price, and hopefully the app will be polished and fine-tuned soon. 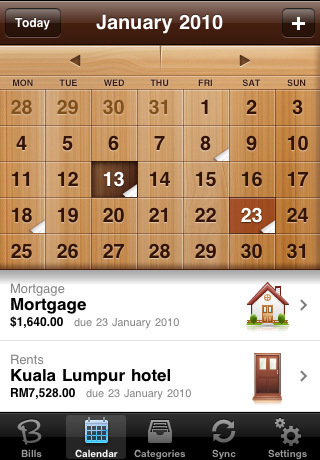 AppSafari review of Bills ~ On your table was written by Julie Guan on March 12th, 2010 and categorized under App Store, Featured, Finance, Productivity. Page viewed 5395 times, 3 so far today. Need help on using these apps? Please read the Help Page. Bill Reminder for iPad: An easy-to-use, full featured bill reminder to help you pay bill in time and stay productive. Get instant alerts on your iPad, iPhone or iPod-Touch as a reminder when your bill is due.